One of the most common questions I get as a food writer and recipe developer is "What happens to all of the food?" For the most part, it does get consumed - eventually. Sometimes it's a bit stale or defrosted from the freezer, but I try. Since I don't use any industry tricks - like using extra oil or lacquer to make things shiny or fake ice cream to keep things from melting, all of the food in the photos is completely edible. Sometimes cake slices may sit out while being photographed a little longer than I 'd prefer, but I do my best not to waste too much. The truth is, it does get tough to keep up with all the sweets. Since the move, we don't have too much family or friends nearby to pawn off half-eaten cakes and partially demolished pies to (after they have been cut into and styled for whatever assignment they were made for) and a large portion of what I make ends up in our freezer. And if I am being completely honest, I create and bake way more than I even need to for this job - resulting in even more treats. I truly enjoy what I do, and just can't stop from trying out recipes and cooking for fun whenever I have a free moment. The best times are when we have visitors - extra mouths that I get to feed! I don't always like to play hostess (mainly for having to have the house all nice and clean, only to destroy it with a huge mess of dishes), but I do enjoying nourishing the bodies and filling the bellies of my loved ones. My family from Michigan is in town this week - what a great excuse to throw a small dinner party! There are soooo many great restaurants in town that I will to take them to, but I saved a chance to feed them some of my favorite spring/summer small plates and sweet treats. Selfishly, I got to try out some new seasonal recipes and cook with reckless abandon all while making others full and happy and not worrying about pounds of leftovers. A win/win for everyone! 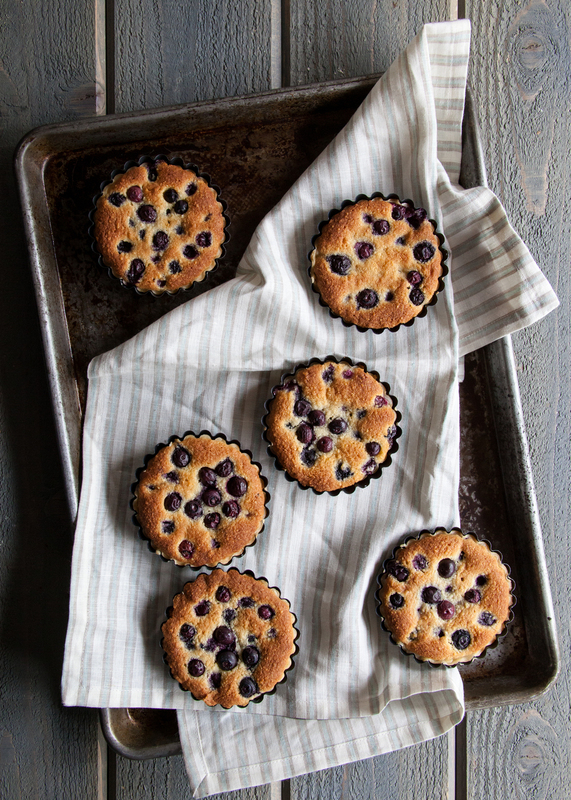 I am sharing these Blueberry Frangipane Tartlets first because they turned out so cute and perfect. And it goes along with my 'Dessert First' philosophy, hehe. Blueberries have been on sale by the pint lately, and I was so excited to throw them into a dessert. I've been waiting for months and months for berry season to arrive, and we are just about there! I see many strawberry scones, raspberry tea cakes, and blackberry crisps in my near future! This recipe was adapted from the beautiful book, Bountiful. Once I saw the photos of their perfectly golden, blueberry-studded baby tarts, I knew I had to make them. Almond is actually one of my all-time favourite flavours, so frangipane desserts or anything made with almond paste always pull me in. The sweet, almond filling is extremely moist and tender, encrusted by a buttery, flakey shell, and FULL of fresh blueberries. I chose this recipe for our get together for a few different reasons. I wanted a dessert that wasn't too fussy but still slightly unexpected. I thought pie at first, but once you slice into pie it always turns into a mess - at least for me. I like the appeal of individual pies and tarts, each contained in its on little shell to minimize the slop-factor of larger pies. And, who doesn't get excited when they see that they have their own mini treat? The frangipane really takes thing to the next level. I also made a chocolate dessert (recipe to come soon), so I wanted something fruity. You might be thinking - individual tartlets for a dinner party? What a pain in the booty! I thought it might be at first, but to tell the truth - this was one of the easiest things I have made in a while. I cheated with some pre-made pie crust, meaning the rest of the entire dessert would whip up in just one bowl. Only one bowl to wash in order to make these little beauties? I tell ya, this recipe is a real winner. I usually make cakes and desserts with multiple components - requiring many many dishes, clearing out my utensil drawer, and hours of assembly. Once these babies come out of the oven, they are ready to go! 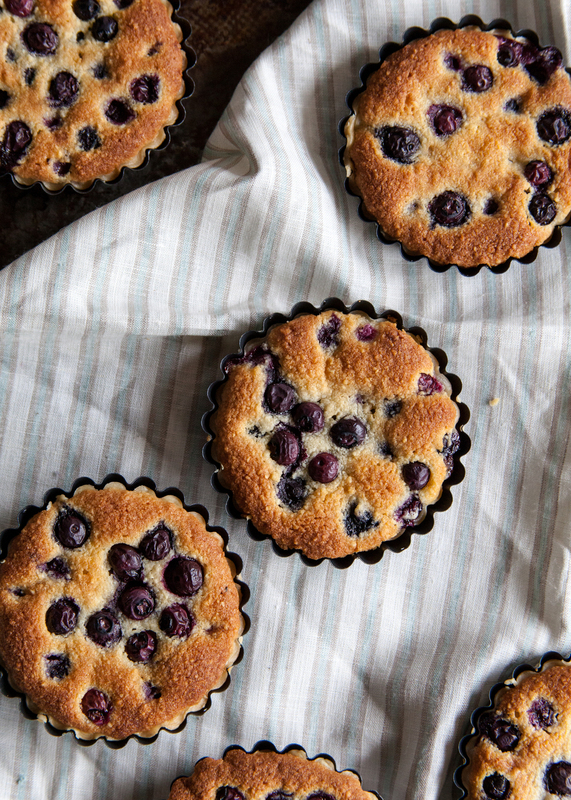 So seriously, the next time you are looking to serve a small crowd (as long as you have enough tart pans, that is), then make these Blueberry Frangipane Tartlets. You can even use pre-made pie crust - I won't tell, hehe. I'll be sharing some tips and tricks from Cascade Platinum and Chef Michael Smith on how to throw a sparkling dinner party plus more recipes over the next couple of weeks - so stay tuned! Seriously, you won't want to miss the Triple-Layer Tahini Brownies I have on deck for you in a couple days. Yumm! !